Sunrise over the Bells Up Estate vineyard (pictured above) on Sunday, September 24, 2017 marked the first-ever harvest of our Pommard and Dijon Clone 667 Pinot Noir vines, four years after they were planted and one week after our Estate Seyval Blanc harvest. It was an emotional morning, as we picked Kelly’s row, and all the other rows of people we’ve lost and in whose memory we push forward on this crazy “living the dream” lifestyle and winemaking adventure. Here’s a few shots from the day. Block 1, Row 1 of the estate vineyard, Kelly’s row. Harvesting Kelly’s row. Yes, there were a few tears shed by Sara. Our amazing harvest crew absolutely flew through the pick. A quick shot of the freshly-painted winery, whose paint job was completed the day after harvest. Winemaker Dave, in his Superstar Broomball Goalie jersey from well over a decade ago, dumping buckets of picked grapes into our harvest bins. Those buckets are heavy; they hold roughly 30 pounds of fruit each. Hello gorgeous Pommard pinot noir. Can’t wait to see how your pre-fermentation flavors of passion fruit and blueberry shine with the watermelon flavors of the Dijon Clone 667 in the final 2017 Estate Rosé! Our amazing sorting crew included neighbors, family, Fanfare Club members, and even lifestyle blog Satiate’s Tamara Belgard (who was hiding in this picture). Grapes released from their stems by the destemmer, falling into the fermenter for a cold soak prior to pressing. 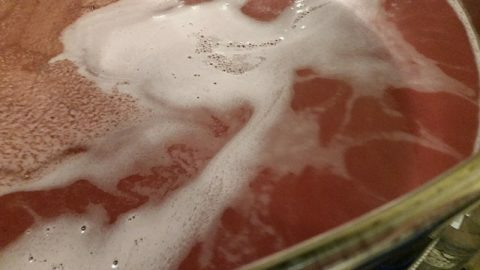 Below, a quick video tour of the pressed 2017 Prelude Estate Rosé fermenting away. Rude little yeast; they don’t bother to say “excuse me” with all those burps. We anticipate releasing the 2017 Prelude Estate Rosé of Pinot Noir by April 2018. Stay tuned for more details and posts as this wine develops! 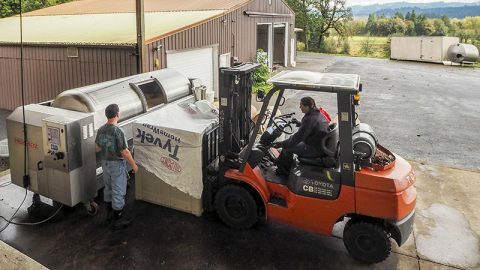 Harvest 2016: Pressing the pinot noirs. Pressing on to the Finish! Yes way 2016 rosé! 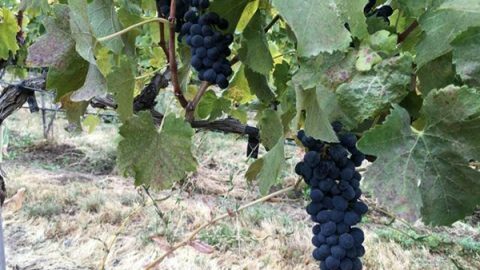 A quick recap of our Prelude rosé of pinot noir harvest. Our First Seyval Blanc Harvest - Sunday, September 19, 2017Remembering Those We've Lost, Part 2.